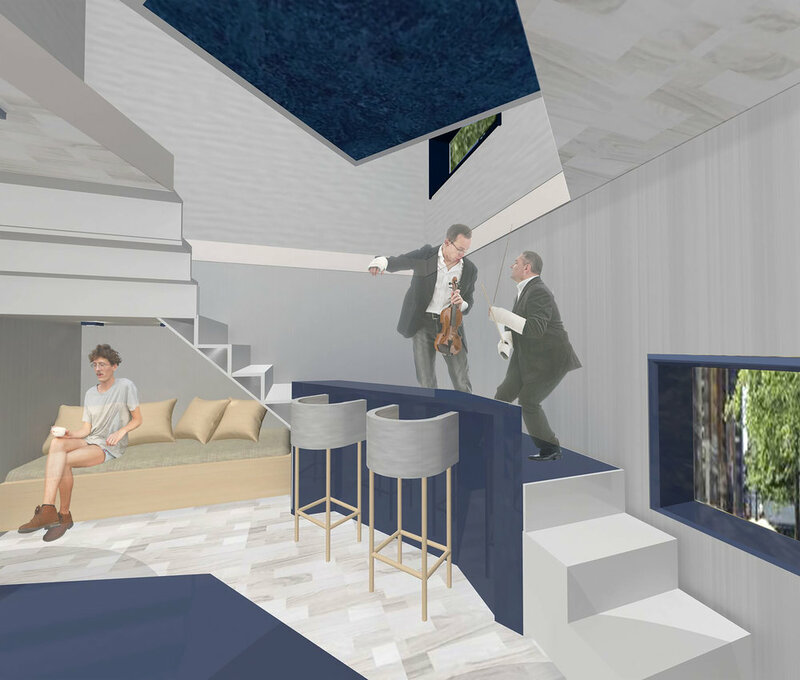 The design proposes performing stages within a residential space for a musician family with four members. Hence, a unity of separation and coherence need to be created, the apartment should provides spaces of intimacy while also accommodating for a group of guests by distributing people to certain areas. Due to the size limitation, certain areas need to have dual functionality to compensate the lack of room. The design stretches out the limitation of the space, allows performing space, by adding flexible of certain area. There are three performing stages within this residential space that in general are stair landing, instrument storage and child musical practice room. Different level of these platforms creates a hierarchy, therefore music flow from 3 different direction, where it bounces off surrounding walls for room- filling sound. There are four people within the family, parents, child and grandma. All of them are musicians; therefore practice rooms are need. Sometime, parents hold musical events, which bring in numbers of guest. Grandma needs personal privacy from parents’ life. Hence, certain distance should lays between their rooms. Also due to lack of space, preforming stage and residential space need be exchangeable.